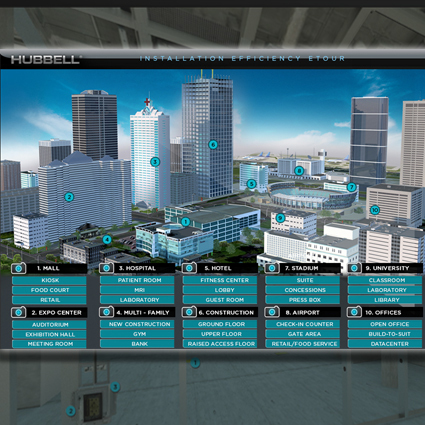 Hubbell Wiring Device-Kellems is excited to announce its latest eTour: an interactive, 360-degree Installation Efficiency eTour, which walks users through different environments and identifies how and where Hubbell solutions can be used to efficiently deliver power, data, and AV—while also supporting fast installation. Users are immediately transported to their selected environment to look around and click to learn more about the power, data, and AV delivery devices deployed there. A list of products that can be used in the space also appears on the left-hand side of the screen, where you can click for additional information. “The 360-degree Installation Efficiency eTour helps us continue to grow our interactive online resources, which are designed to connect new and existing Hubbell customers with solutions that not only efficiently deliver power, data, and AV, but also help them complete jobs faster and more cost effectively,” says John Carroll, vice president of distributor marketing and communications for Hubbell Wiring Device-Kellems. The Installation Efficiency eTour is located on the eTours page of the Hubbell Wiring Device-Kellems website (https://www.hubbell.com/wiringdevice-kellems/en/etours), and can be easily accessed from any desktop, laptop, tablet, or smartphone. To learn more, contact your Hubbell sales representative or visit www.hubbell.com/wiringdevice-kellems/en. Hubbell Wiring Device-Kellems is pleased to announce our 20 amp pop-up receptacle, UL Listed for countertop applications and permanent installations. The receptacle is water-resistant to a half gallon of liquid spilled on the device. Designed for use in commercial applications, the countertop receptacle can be installed on almost any surface. Hubbell Wiring Device-Kellems is excited to announce its new Stage Pin Devices, which solve many of the problems experienced when using these types of devices. The devices are lightweight, impact resistant, ergonomic, easy to wire with removable contacts that snap into place, and feature a removable, highly heat resistant sleeve.